The Vieillot's Black Weaver was formally described by Louis Jean Pierre Vieillot, a French ornithologist. The birds had been collected by Jean Perrein, a French naturalist, who travelled in West Africa and other localities. Vieillot was interested in the habits of living birds, but Perrein did not seem to provide any field notes for the Vieillot's Black Weaver, as he had done for the Crested Malimbe. Vieillot mentioned that the Orange Weaver had been collected at Congo et Caconga, one of three historic provinces in Cabinda, Angola. Perrein returned to France after a long stay in Cabinda, in about 1800. Perrein sent his specimens to Academy of Sciences in Bordeaux, France, from where the Vieillot's Black Weaver type was probably moved to the Paris Museum. 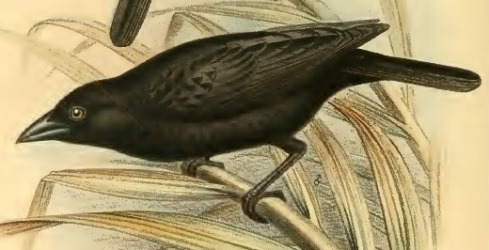 Many early authors referred to the Vieillot's Black Weaver and more specimens of this common weaver were collected in West Africa, but it was only illustrated in 1888 for the first time. 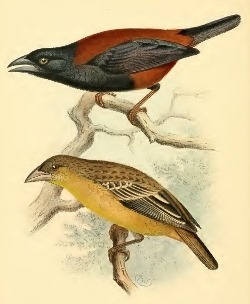 Bartlett (1888) illustrated both subspecies. Ploceus nigerrimus	Vieillot 1819	Nouv. Dict. Hist. Nat., nouv. ed., 34:130	"Kingdom of Congo", Cabinda. nigerrimus Latin: very black (super. of niger, black). Black and chestnut Weaver-bird (Burton 1883). Chestnut and Black Weaver, Vieillot's Weaver. Before 1800, when Perrein returned to France with his specimens. 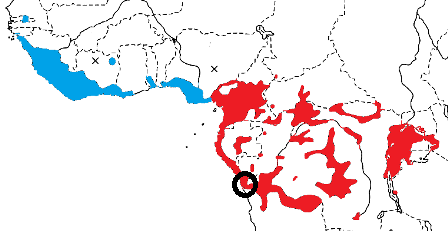 Congo et Caconga, ie. Cabinda, Angola. Type specimen is probably in the Paris Museum.